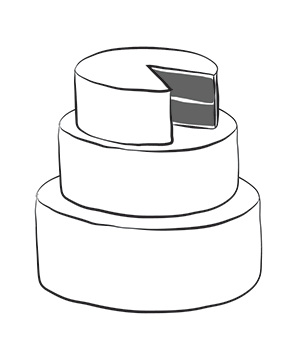 We understand that your wedding cake is a focal point on your special day. We ensure that it reflects your style and personality and complements your chosen wedding design and venue. Each cake is designed side by side with you and is crafted with the utmost attention to detail. All prices include a consultation, design session, and tasting. 1-tier wedding cake - Starts at $100 - 8" round - includes two layers of cake with a filling, simple fondant design. 3-tier wedding cake - Starts at $300 - 10" round, 8" round, and 6" round - each tier includes two layers of cake with a filling, simple fondant design. 2-tier wedding cake - Starts at $200 - 8" and 6" round - each tier includes two layers of cake with a filling, simple fondant design. 4-tier wedding cake - Starts at $400 - 12" round, 10" round, 8" round, and 6" round - each tier includes two layers of cake with a filling, simple fondant design. Other Options: The possibilities really are endless! The above prices are for basic round cakes. 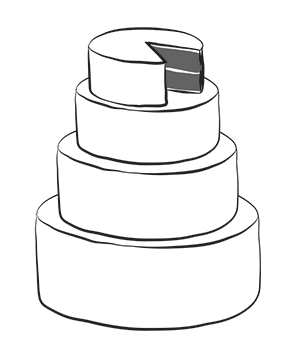 You can incorporate other shapes and sizes of cakes, as well as shorter or taller tiers - at an additional cost. The price will also increase with more complex design elements such as sugar flowers, hand-painting, piping work, etc. In certain cases, the price will lower (like for instance - a naked cake) - schedule a consultation below to get an exact quote for your cake.